Friends; first of all I would urge all loyal readers of this humble journal to go and order a the pair of carriages which comprise the new Roxey Mouldings’ LB&SCR 1909 push pull sets (not yet illustrated on their website), recently acquired from the MSC stable. For your delight there’s a driving composite to LBSCR Diagram 109/111 – SR Diagram 434/435, and a trailer third to SR Diagram 79. I’m certain they’re lovely kits and you will all be happy with at least one, if not more on your layout, whatever your scale, region or period. Good news! The previously unidentified Great Northern covered vans described here have been…well…identified, It appears that the vans were introduced in 1875 (or possibly 1879) and lasted in service right through the Basilica Fields timeframe, the last examples being withdrawn in the years immediately following Grouping. Not only that, but all this time a kit for them has been available. It was part of the MSC range, now scattered to various manufacturers, and the artwork suggests that someone like Tim Hughes may well have been involved in the origination. The kits recently found a new home under the Roxey Mouldings banner and I was fortunately able to obtain the three kits which constituted Dave Hammersley’s entire stock at the recent Railex spectacular in Aylesbury. This is a good start, but more examples are required. I’ve got my order in for more from the next batch delivered from the etcher, but unfortunately the artwork for the vans is on the corner of an etched sheet for the above mentioned Brighton push pull set and, rather sensibly, Dave won’t order more frets from the etchers until his present stock of push pull kits reduces. What? You thought there wasn’t a method in the above madness? Now this is a conundrum… how to ask a small and simple question about a subject which is so little considered and yet was of such importance to the carriage of goods in the late 19th century… and a subject which was relevant to all railway companies since wagons from most (any?) of those companies could have been seen on the Extended Widened Lines. OK, possibly wagons of the North London Railway might not have penetrated the gloom of those hallowed tracks.. maybe a reader can offer a plausible scenario for NLR wagons working over the EWL? So to the subject of this post… sheets ands ropes, required in their thousands for covering and protecting goods in transit when carried in open wagons. Much has been written about how the railway companies managed the movement of loaded and empty wagons…. and about how the Railway Clearing House kept records of foreign* wagon movements between railway companies…. little has been written about the management and return of the sheets and ropes which would have made similar journeys across railway boundaries. A good explaination of how the Midland Railway (and its successors) managed wagon sheets and associated ropes is provided by Midland Record No.3 (Wild Swan)… good enough to prompt investigation into how things were done on other railways. Such a task seems necessary to the working of goods services through Basicilia Fields and yet such a task is onerous in the extreme. * Midland Railway (recorded in Midland Record No.3). * foreign in this context means a wagon owned by railway company “A” working over the tracks of railway company “B”. Bit of a lull in proceedings I’m afraid, due entirely to the uncertainties of selling a house and buying another, and the inordinate amount of time taken up with all that entails. So, as a bit of an intermission (grab your ice creams)… I’ve had this print for a little while and thought I’d better get a frame to protect it during the intended move. I doubt there are many artists who’d find inspiration enough to produce a painting of the Inner Circle (although another was the catalyst for this whole project) which I think is fantastic and captures the spirit of the prototype. 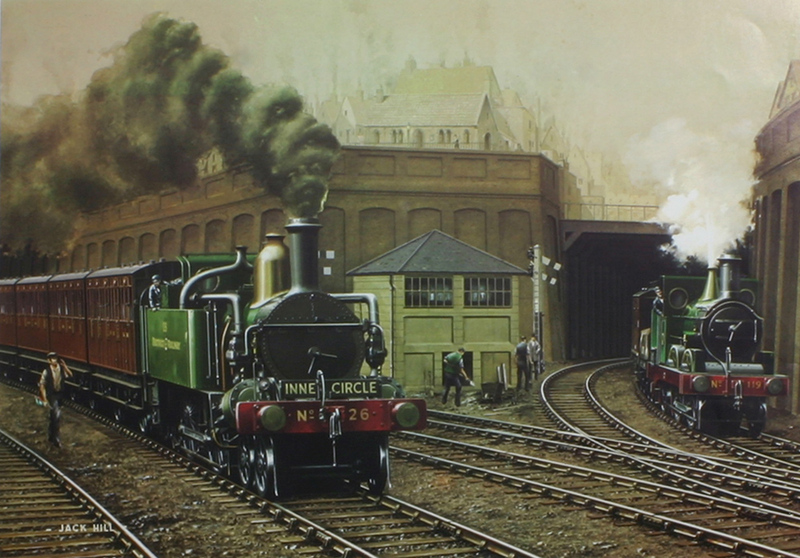 The District train on the left is on the Inner Circle and the Great Northern 126 class No.119 is coming up from Ludgate Hill with a goods train. Although exact numbers varied during the 1880s and 1890s, the GNR was in charge of approximately fifty goods trains which daily crossed the Thames via the Widened Lines, half of which were mandatory, the rest running as required. The Great Northern introduced a 19′ covered van in 1906 and vans for perishable traffics were built to the same design, unfortunately all fall just outside of the Basilica time frame in the strictest sense so will not appear here. 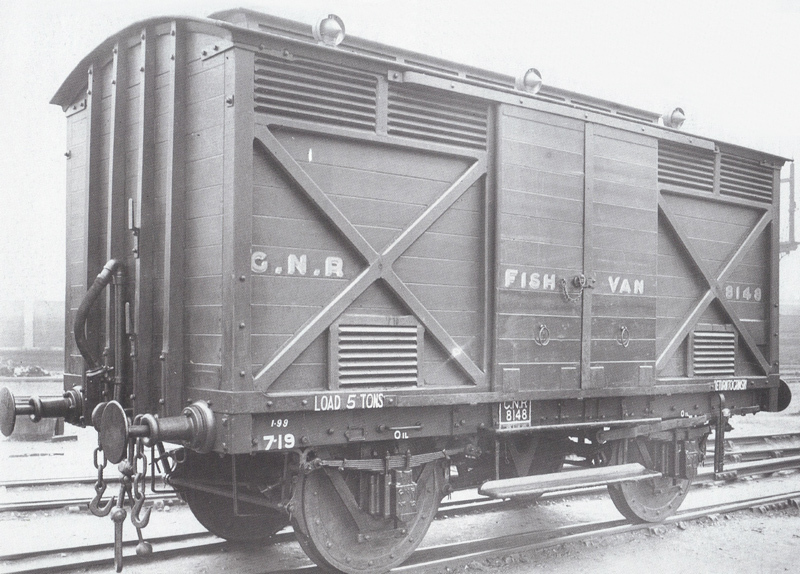 However, there were at least two types of 19′ long refrigerated vans in service at the turn of the century; Diagram 113, for which I have seen neither drawing nor photograph and have limited information (8 tons, 10 meat hooks, 4 end posts and two sample numbers 30127 & 430133), and Diagram 116, illustrated below. These vans had insulated bodywork lined with zinc sheeting and internal ice boxes at each end into which fresh ice was fed though sealed hatches in the roof. The cupboard doors were fitted with India rubber piping to ensure an airtight seal. All were designed for meat traffic and were fitted with 12 meat hooks on traverse bars. As before, they were fitted with all the trappings of contemporary fast-fitted goods vans, and as well as the vacuum brake, were fitted with the Westinghouse brake (or more likely a through pipe). No. 9494 was built in March 1900, and carried the standard livery of refrigerated vans – white with black (some possibly brown oxide) solebars, buffers and running gear. Sources disagree on the colour of the lettering and shading and it also displays the legend, ‘To be returned to Victoria Dock when empty’. I would be very interested to learn the dates both Diagrams 113 and 116 were introduced, any examples of running numbers beyond those given in Tatlow, and especially drawings of either type. 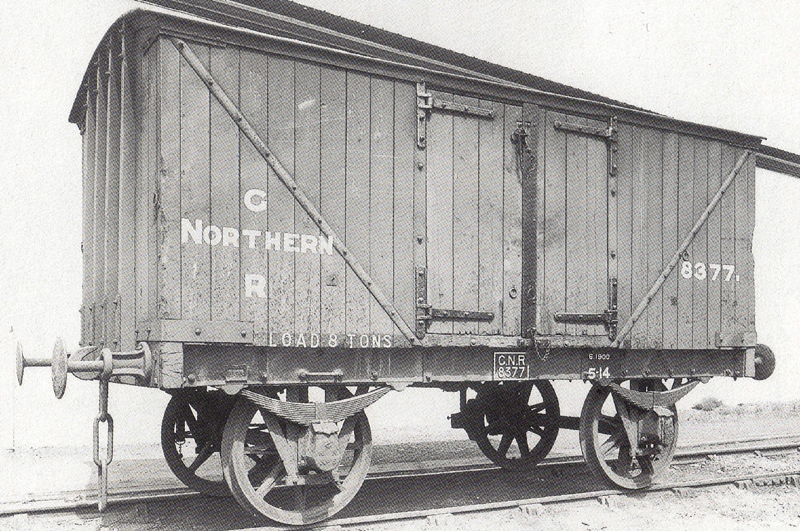 Around the turn of the century, the Great Northern elongated their standard 6T covered vans to 18′ over headstocks but changed the design to an inside-framed body with sliding doors to the right hand side. Initial batches of these Dia.117 vans had 3′ 6″ Mansell wheels, opposite hand brakes, and retained the four end posts. Later batches which were rated at 8T, gained ventilators in the ends, losing two of the posts in the process. I would be very interested in the introductory date of these vans, but this entry is more concerned with the 18′ vans for perishable traffics. Five ton perishable vans to 18′ retained the outside wooden cross frames of the 16′ designs and sported a variety of ventilator positions depending on the designated use. Diagram 110 was designated for fruit and milk traffic, and Diagram 111 for fish, the former having louvres in the tops of the cupboard doors, the latter having plain sliding doors to the left and right. All had clerestory louvred roofs with three torpedo vents each side. Fish van no.8148 of 1899, built for traffic between Grimsby and London, exhibits all the contemporary standard fittings for GN vans designed for fast perishable goods; two foot boards, tall vacuum brake standard, screw couplings, safety chains, oil axle boxes, carriage-type swing-links to the springs, Mansell wheels, long spindle buffers, either-side brakes and carriage-style shaded lettering on the GNR brown oxide paintwork. I’d be very interested to find out the date in which both diagrams 110 and 11 were introduced. Following closely on the heels of the last post, I am interested in more information on the GNR 16′ covered vans for perishable traffics. There were a number of van types which appear to have been based on the 16′ outside framed van with 9′ 6″ wheelbase and four end posts, but with alterations to the roof (louvred clerestory and torpedo ventilators), to the body (various louvred openings) and fitted with the automatic vacuum brake and Westinghouse brake or through pipe, screw couplings, side chains, oil axle boxes, and sometimes, but not always, Mansell wheels. On release to traffic two step boards below the centre doors were also fitted. 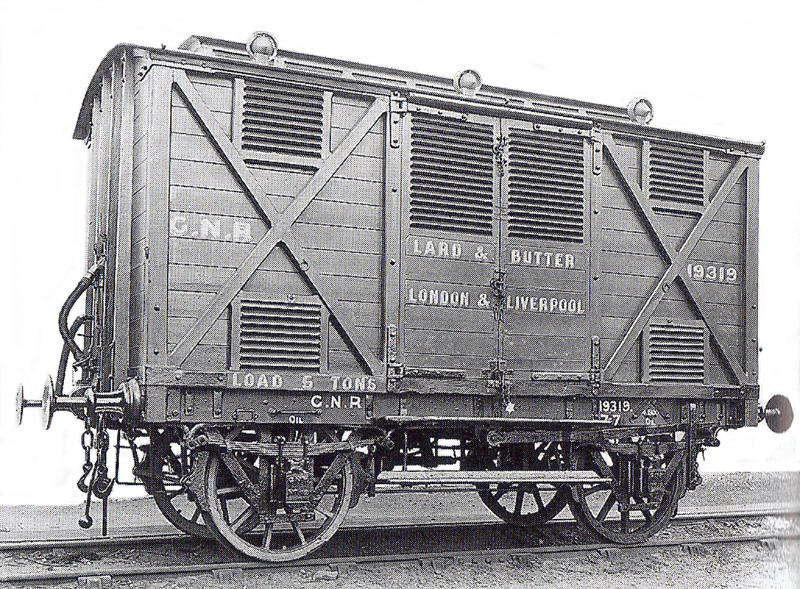 Ventilated van 19319, to Diagram 114, with a load capacity of five tons was one of a number of vehicles built for the conveyance of lard and butter between London and Liverpool and may have been built (or repainted!) in April 1900. I understand it is recorded on page/block 16/7 of the official GN book of wagon illustrations. A (non-diagrammed?) 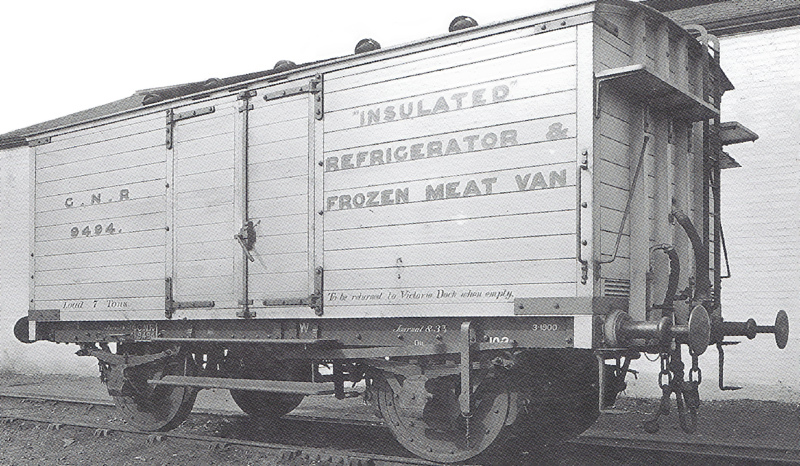 meat van, page/block 16/12 of which No.9213 was built in 1899. Any information and/or corrections to the above vehicles greatly appreciated. I’m also keen to hear comments on the livery. Despite the large GN initials being introduced in on goods stock in 1898,covered vans for special traffic obviously continued to have been lettered with small shaded figures. August flew past without a single entry to the journal – not sure how that happened, but it has been very busy here of late. Time to pick the collective brain of the readership; Great Northern general merchandise vans are nicely illustrated by Peter Tatlow in Part One of his history of LNER wagons (Wild Swan), but whereas the section on the Great Eastern (which, in my opinion, is unnecessarily shorter than the Great Northern and Great Central sections) gives the reader various dates of introduction of the types, the Great Northern section is decidedly mute on the matter. All very well I suppose, if you’ve no more than a casual interest or your modelling is set during the Grouping (a census of types taken in 1922, 1940 and 1947 is given in each chapter), and I admit the book is pitched predominantly at those with an interest in the LNER period, but is less useful for those of us modelling earlier decades. So, on with the queries. This type isn’t mentioned or illustrated in Tatlow, so I assume was extinct by Grouping. It’s not unlike Diagram 118 (LNER code 4082) which was an express, dual fitted van, though the latter omitted the diagonal ironwork. The number of planks suggests it is also 16′ long. It retains the original single lever acting on a single wheel brake block, and despite the June 1900 date on the solebar (which may indicate the date of the photo, rather than the repaint date), shows the pre-1898 livery in quite a dilapidated condition. One wonders why (an apparently official) photograph was taken of this particular van in such a condition, unless the type was to become extinct in the near future? 1. When was the type introduced? 2. When did the type become extinct? 3. (Very long shot) is there a drawing of it? There is now a follow up post to this query here.